Notice: Undefined index: isbn in /customers/6/2/a/elephant.se/httpd.www/database2.php on line 1540 Born at the Barnum and London winter quarters at Bridgeport, Connecticut, in 1882. She was named Bridgeport and was burned up in the fire in 1886 that destroyed much of the splendid menagerie of Barnum and Bailey. Times story: At 8 o’clock last evening 20 elephants of various sizes were chained by one of their hind legs to stout posts in a circle close to a sawdust ring. Eight minutes later Queen, who was chained to a heavy post in the centre of the ring, was delivered of an heir, whose entrée into public life was greeted with a succession of roars from all the elephants in the building. Mr. Barnum was quickly summoned from his home. He shook the hands of all the attendants and was as lively as the liveliest young man in Bridgeport, although nearly 71 years of age. Drs. Cole, Sanford, Porter, Bronson and Hubbard, of this city, soon arrived and everybody, excepting the elephants, was disposed to merrymaking. The elephants seemed to take a gloomy view of the situation, and, while continuously swaying to and fro, winked in an ominous manner or flapped their blanket-like ears as though preparing to strike terror to the hearts of those of the human race who stood close to the outer circle of the ring. Chieftain, the father of the baby, was apparently more sullen than the rest, and manifested a desire to lean up against the wall in his corner and kick. He shrieked like a calliope when anyone approached him, and it was deemed best to leave him to his meditations. The baby lay in the hay and sawdust at the feet of its mother for several minutes, while the mother rubbed its body with her huge trunk. Queen was very nervous, the showmen thought, and they did not bother her while she was thus engaged. She essayed to raise her newborn daughter to her feet, but the little one, to the astonishment of all, rose of her own accord and attempted to plant her block-like feet squarely on the sawdust. The mother closely eyed her offspring, and it was thought that either she or it, or both, would soon take a notion to lie on the hay that the attendants had freely scattered in the ring. The baby at first tottered and then to the delight of the lookers-on began for the first time in its life the swaying motion peculiar to all elephants. The circus artist and historian measured and weighed the baby shortly after her birth. She was 30 inches in height, 36 inches in width and weighed 145 pounds. She was of bluish color at birth but changed to a delicate mouse shade. Her trunk was 7 1/2 inches in length, measuring from the underlip, and the tail was so short that no attempt was made to measure it. The Times said: “The baby, as one of the spectators expressed it, was ‘all legs.’ She had two teeth. She waddled about in close proximity to her mother’s heavy feet and was apparently in danger of being tripped up and trampled upon, but her immense mother moved as cautiously as though stepping on glass and reached the baby with her trunk whenever the little one rested against her hind legs. 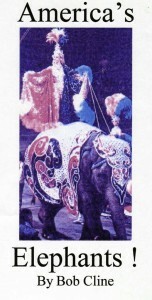 The circus company named the newcomer America, as she was only the second elephant born in captivity, but in the media frenzy that followed, the name was largely forgotten, and after the Times and other papers reported the event, America became known around the country as Baby Bridgeport. Elefanten in Zoo und Circus EEG: Haufellner, Kurt, Schilfarth, Schweiger*Bob Cline, Cheraw, South Carolina, United States.